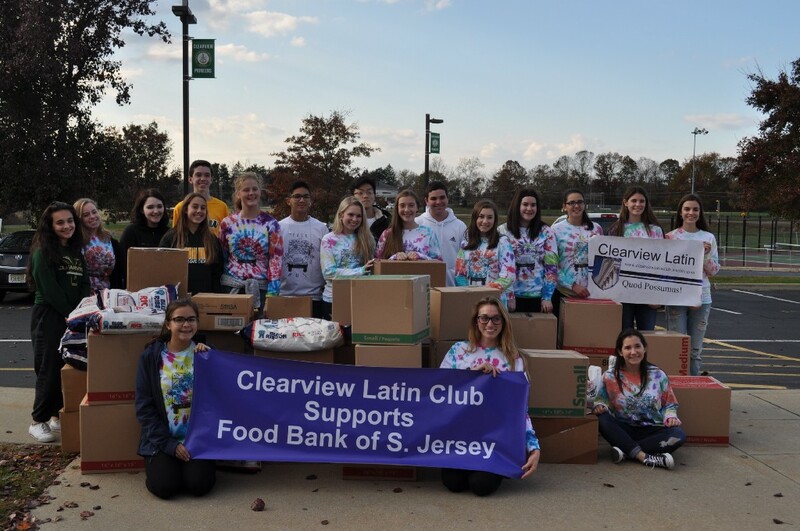 The Clearview Regional High School Latin Club exceeded the goal of collecting one ton of goods for families in need through the annual Pack the Bus Food Drive on Thursday, Nov. 16, when students delivered more than 2,500 pounds of food, and a check for more than $500 to the Students Change Hunger program through the Food Bank of South Jersey. According to advisor and world language teacher Martha Pearlman, alongside the food and goods donated to families in need, every dollar raised is also equivalent to one pound of food. On Thursday, Nov. 16, members of the Latin Club loaded the ton of food donations onto a school bus and hand delivered the goods to the Food Bank of South Jersey. Once there, the donations were weighed and students were given a tour of the facility to see how their contributions make an impact in the region. Through the Students Change Hunger program, organized by the Federation of New Jersey Food Banks, schools throughout the state compete with each other to collect as much food donations as possible from Sept. 18 through Dec. 11. At the end of the challenge, the school that donates the most food is honored with an award by their local food bank. According to the Students Change Hunger website, www.studentschangehunger.org, 2016 was a record year with 229 participating schools, collecting more than 230,000 pounds of food and more than $30,000. Last year, Clearview placed third in the statewide competition, according to junior Latin Club Student Ambassador Hannah Specht. By attending the award ceremony, Specht said, she was able to learn from other schools of fundraising ideas and techniques to collect more food donations and monetary contributions this year. For example, this year the club sold T-shirts, bracelets and held a Jeans Day for faculty and staff for a donation. To collect food, students passed out flyers to local neighborhoods, as well as advertised the cause throughout the school and on View News, the school’s television channel and morning announcements. According to Pearlman, each year the Latin Club participates in the National Junior Classical League, where Clearview has been awarded at the annual national convention for community service. Last year, the Latin Club won first place for community service for the first time in program history with more than 700 community service hours compiled by the club’s 140 members. Clearview Regional High School has its own anonymous food pantry for students, offering snacks and food throughout the day, as well as backpacks of food children can take home over a weekend. “Just seeing how many people in our community need the help, it’s not always apparent, especially in an area such as Mullica Hill, but they do so it’s nice to have these food drives to help,” Specht said.